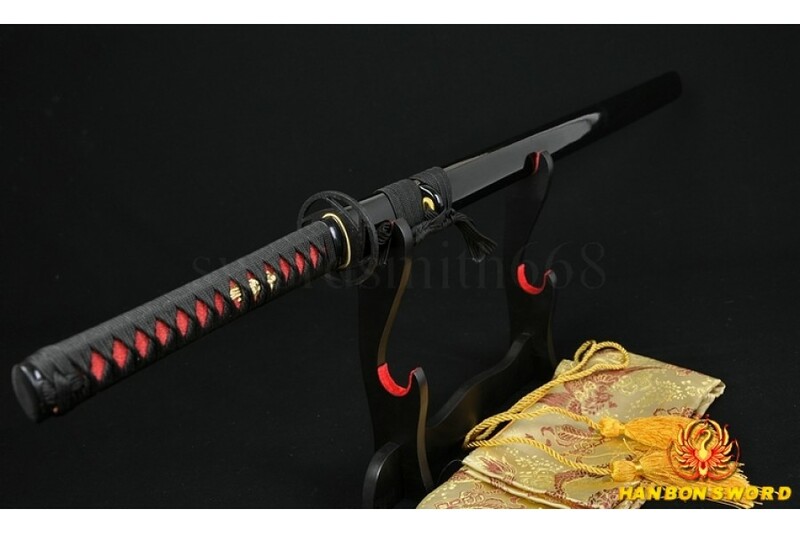 This Japanese sword Ninjato has been hand forged using the ancient method of sword making. Full hand forged, hand polished and hand sharpened. The black blade is made of 1060 high cartbon steel, it has been heat treated and oil quenched. 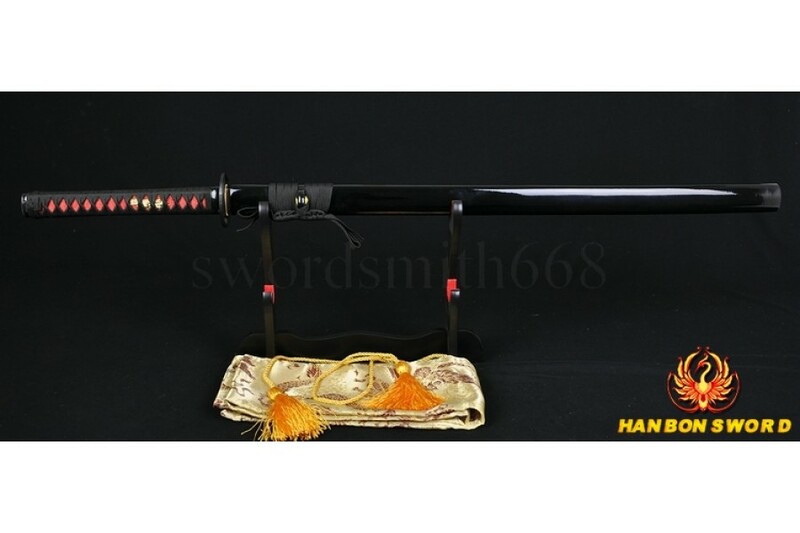 This sword comes with full tang which greatly enhances the strength of the sword, and this blade has been hand polished with multiple grade sharpen stone by Japanese method, the black color on the surface of the blade is special treated, the black color can prevent the blade from rusting. Normally, the black color will not fade unless you re-polish the blade. Fine finished round iron tsuba with two copper seppas (spacer) securing. The wooden tsuka(handle) is tightly wrapped with red genuine Ray skin Samegawa and black synthetic silk Ito. 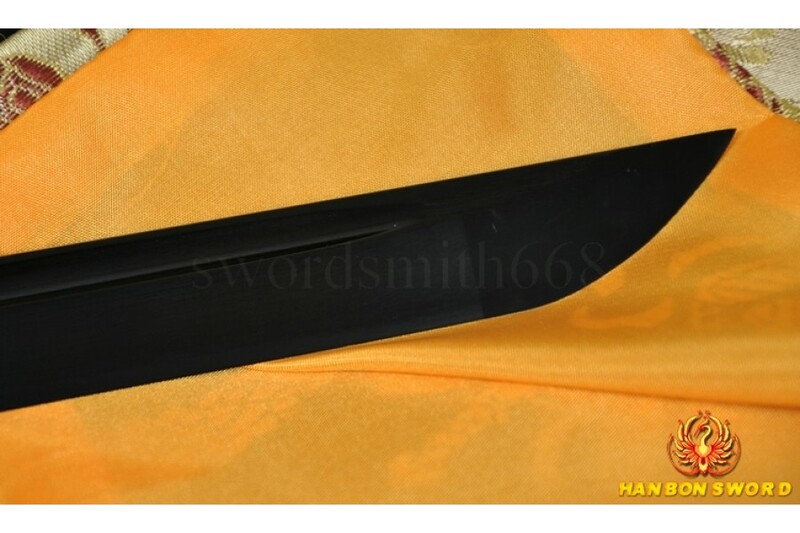 Black high gloss finished saya(sheath) is made of hard wooden. Black synthetic sage-O has been tied around the bright copper Kurigaga (knob) of the scabbard. the Koiguchi has been hardened. 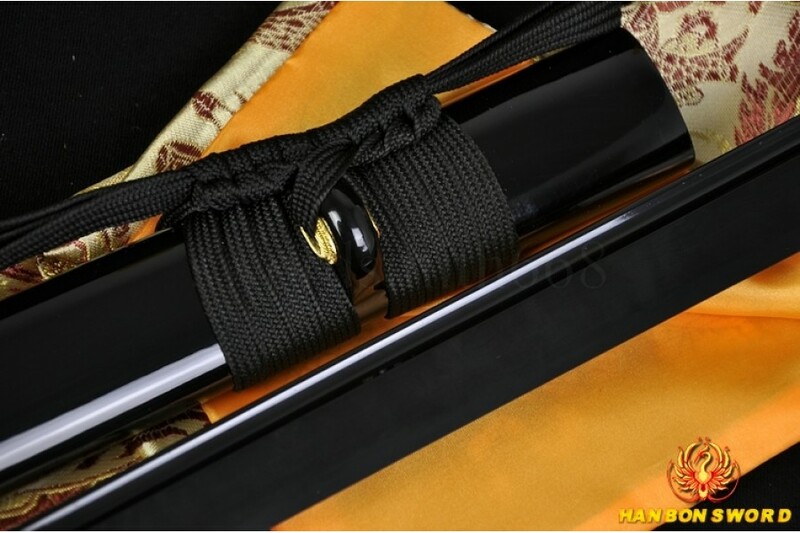 It is a very good choice not only for dojo and iaido use,but also for gifts, cutting practice, display, and collection. Just buy it! --- Please Select --- S01: Green S02: Blue S03: White S04: Black/Red S05: Deep Blue with speckle S06: Deep red with speckle S07: Black matt finish S08: Red S10: Glossy Black S11: Reddish brown with black speckle S12: Black with red threadiness S14: Reddish brown stripe S15: White with black fumy S16: Black/white S20: Natural hualee wood+bull horn (+$45.00) S22: Purplish red+bull horn (+$35.00) S24: Red rayskin wrapped saya (+$45.00) S25: Black rayskin wrapped saya (+$45.00) S26: Green rayskin wrapped saya (+$45.00) S28: Brown leather wrapped saya with strap (+$45.00) S29: Black leather wrapped saya with strap (+$45.00) -Other: please write a note in text box below. This Tanto sword is full hand made, the blade is 1095 high carbon steel with grooves (bo-hi) on both sides, which allows for a lighter blade and audible feedback when swung. The blade of this tanto is hand polished and hand sharpened by 12 steps which create the surface of the blade like a morrior. This blade also comes with a full length Tang which greatly enhances the strength of the sword while swung.The tang will be filed to match well with the handle. 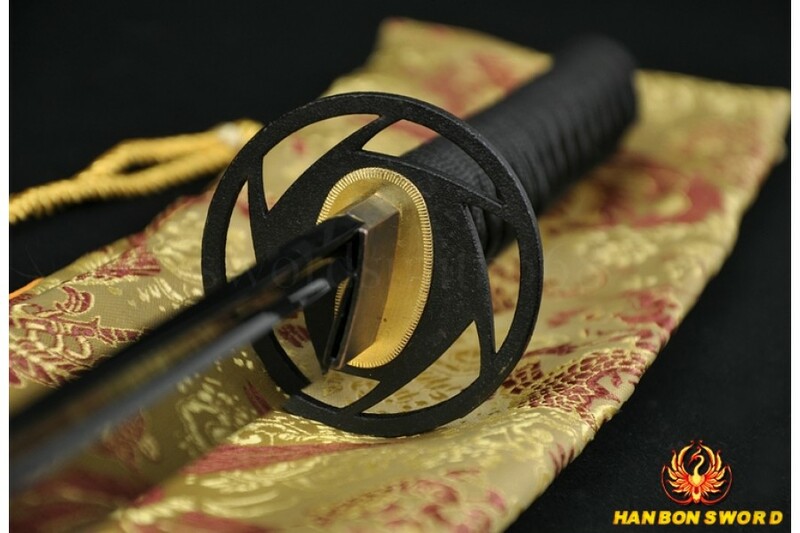 The tsuba (guard) is made from blackene.. This black Wakizshi is fully hand forged. 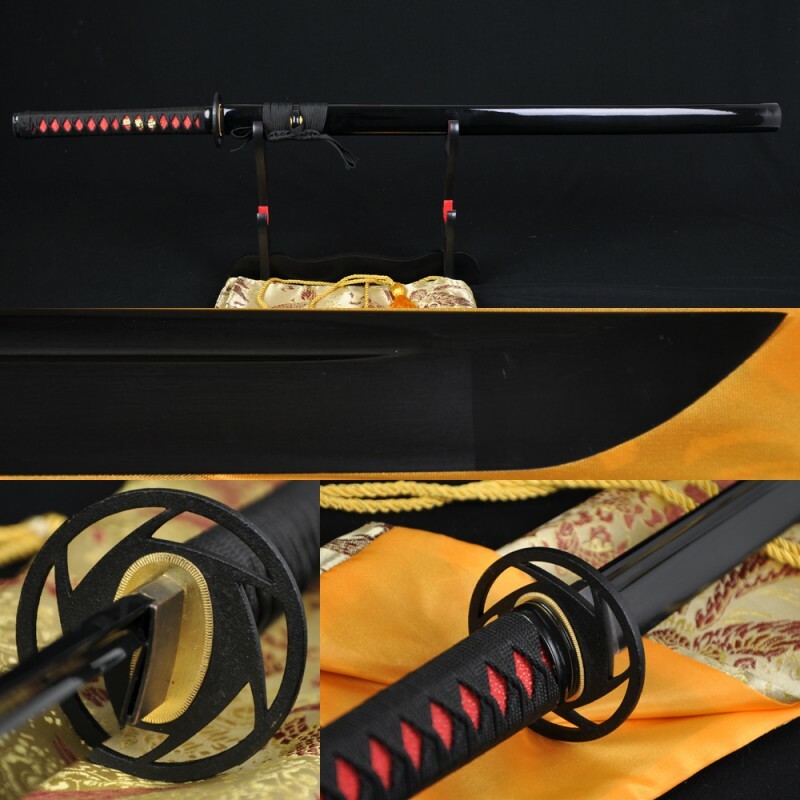 the blade of this wakizashi is made of high carbon steel, the whole blade is heat treated and oil quenched. 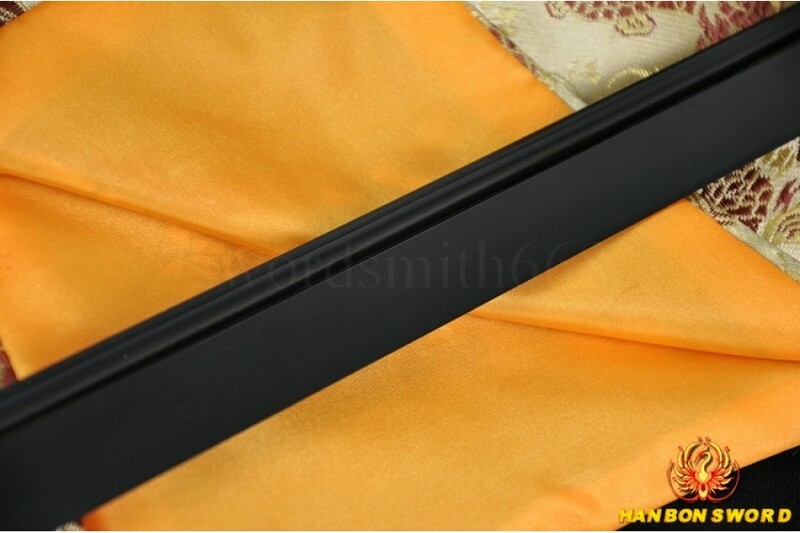 the black color on the surface of the blade is special treated, the black color can prevent the blade from rusting. Normally, the black color will not fade unless you re-polish the blade. This blade comes with a full length Tang which greatly enhances the strength of the sword while swung.The tang will be filed to match well with the handle. The bl.. This Katana sword is hand forged and hand sharpened using Japanese methods to create the perfect blade for iaido and kenjutsu use. 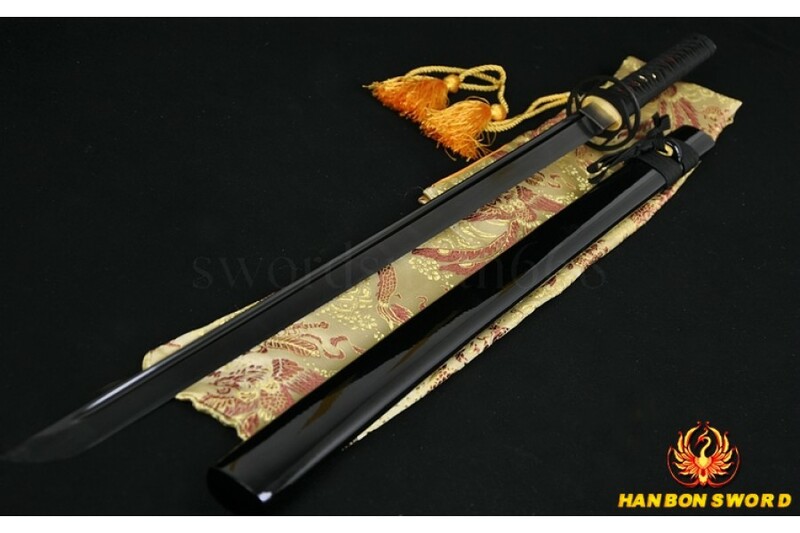 It has black blade which is made of 1060 high carbon steel, and the blade is heat-treated, and oil quenched to achieve optimal levels of flexibility and hardness. Normally, the black color will not fade unless you re-polish the blade, and the blade is also very sharp. The long Hi (blood groove) on each side, this not only allows for a lighter blade and audible feedba.. 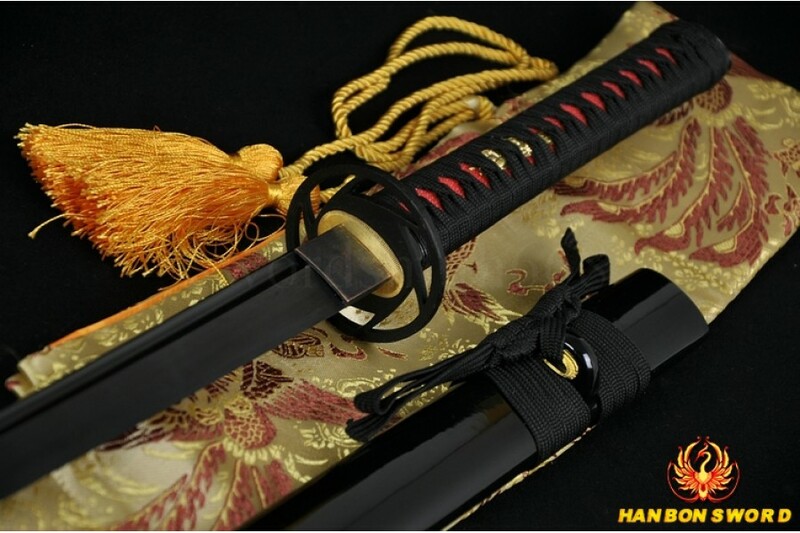 This excellent japanese samurai KATANA has been hand made by hanbon forge. The full tang blade has been constructed from 1060 high carbon steel with special treated, and it has been laminated in a Maru style. The whole blade was hardened by oil quenched, the black color can prevent the blade from rusting. Normally, the black color will not fade unless you re-polish the blade. It has long HI(blood groove) on each side and a CHU-kissaki on the top. The dragon design tsuba(guard) is made of fine fi.. The Ninjato (忍者刀) is allegedly one of the preferred weapons that the Shinobi of feudal Japan carried. 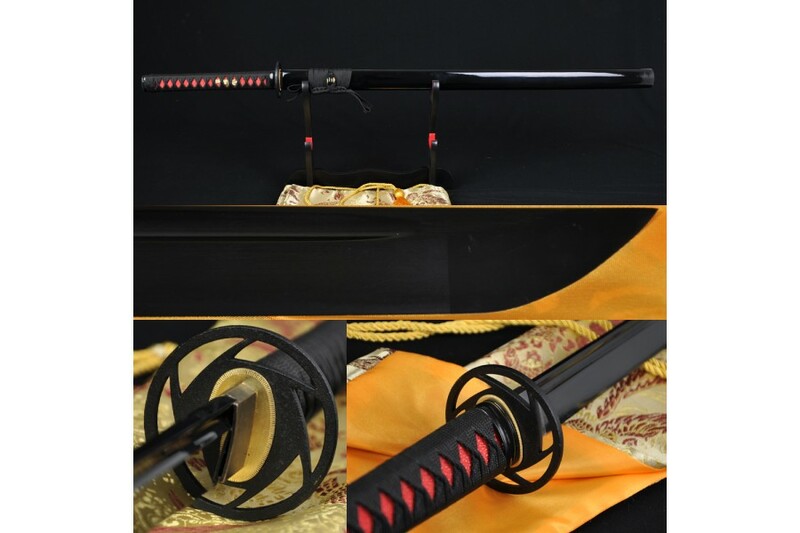 This ninja sword is hand made with traditional technology, in the blade style of Kiriha Zukuri. The blade is 1060 high carbon steel with special treated, black color by electroplating on the surface prevents blade from rusting. Bo Hi (blood grooves) on each side can balance the blade to achieve optimal performance when swung. The blade is full tang and hand sharpened, suitable for battle.The say..